Office opening October 2015 - Community acupuncture, Wholistic Kinesiology, NAET allergy desensitization treatments are offered. Acupuncture and Chinese herbs are tools used in clinical Chinese medicine to restore the proper functioning of the body in order to eliminate illness and imbalances. This is what is meant by ‘holistic’- we treat the individual who has the ‘dis-ease’, rather than treating the disease. By treating the ‘root’, not only are current symptoms eliminated, but future illness is often averted. ‘Treating the root’ means we re-establish the normal dynamics of the body that have somehow been thrown off. Chinese medicine has been time tested for thousands of years, morphing and evolving into a marvelous system of understanding the body and the factors of illness. What can I expect from an acupuncture & herbal treatment? Many people find acupuncture to be very relaxing. Falling asleep during a treatment is not uncommon! A treatment lasts about one hour. An evaluation of your condition includes being asked questions and other diagnostic methods such as taking the pulse, and palpating meridian channels. During a private appointment, other therapies are utilized including cupping, massage, heat therapy. Patients leave the treatment room feeling relaxed and rejuvenated with a greater sense of balance. Acupuncture works by inserting sterile, solid, hair fine needles into designated places on the body which lie along meridians. The needles help to restore the physiological dynamic flow of the life force. The meridians are like river ways. Acupuncture works to keep these meridians free flowing in order to prevent pain, and irrigate the body with beneficial fluids and energy. Acupuncture is safe practiced in the hands of a licensed professional. Practitioners must pass a national acupuncture and herbalogy exam before attaining national certification. To practice within a state, national certification is required plus meeting the requirements set by the state. I use disposable, sterile needles. There are very few side effects from acupuncture. Acupuncture needles come in all lengths and widths, like nails and screws, depending on the job. They are sterile and used once. The used needles go into a biohazard box for disposal. The needles are about the size of a hair. Insertion is into the skin. Needles are left for a minimum of 15 to 20 minutes. Clients are advised to minimize movement. Most people do not feel the needle insertion. Occasionally they may sting briefly. All acupuncturists with national certification are required to pass the Clean Needle test to ensure that their handling of needles avoids all contamination and dangers from poor needling. Acupuncture needles are not used on young children or on those who prefer other methods. Teishin, the practice of holding specialized needles close to the skin, is used for young children. Electric stimulation, laser, magnets, and seeds are other tools for people who would prefer to avoid needles. 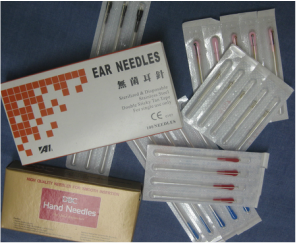 All of the methods described are effective in eliciting a response and needles are considered to be the most effective. Cupping involves placing sterilized cups, typically made of glass, on bare skin and creating a vacuum between cup and skin so that the skin and fascia of that area are bound closely together. The suction and negative pressure provided by cupping can loosen muscles, encourage blood flow, and sedate the nervous system. Cupping is used to relieve back and neck pains, stiff muscles, anxiety, fatigue, migraines, rheumatism, phlegm and other respiratory ailments, and even cellulite. Like acupuncture, cupping follows the lines of the meridians. There are five meridian lines on the back, and these are where the cups are usually placed. Using these points, cupping can help align and relax qi, as well as target more specific maladies. By targeting the meridian channels, cupping strives to 'open' these channels. The paths through which life energy flows freely throughout the body, through all tissues and organs, thus providing a smoother and more free-flowing qi (life force). Gua Sha is a traditional Chinese medical treatment in which the skin is scraped to produce light bruising. Gua sha releases unhealthy elements from injured areas and stimulates blood flow and healing. The smooth edge of the gua sha tool is placed against the oiled skin surface, pressed down firmly, and then moved down the muscles or along the pathway of the acupuncture meridians along the surface of the skin with each stroke being aout 4 - 6 inches long. This causes extravasation of blood from the peripheral capillaries and may result in sub-cutaneous blemishing , which usually takes 2–4 days to fade. The practice of gua sha is experienced as pleasant with diminishment of previous muscle aches or tension. In China, cupping and gua sha are widely available from　national and public hospitals to private massage shops. Because of local people's deep trust to CTM(Chinese Traditional Medicine) and reasonable price, they are very popular. "Constance Gehring's expertise was the only thing that helped my back pain when nothing else was working. I've felt healthier and pain free for over a year thanks to her help."